The lender, a New York City based private equity fund, entered a motion to appoint a Receiver to preserve the asset value of a 22-story masonry 359-room hotel constructed in 1927 located in the Streeterville neighborhood of downtown Chicago. 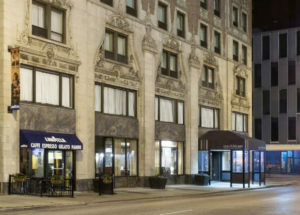 The Hotel entered Receivership under the jurisdiction of the Chancery Division of the Cook County Circuit Court to establish court-supervised control of the cash, operating activities and negotiation of the union contracts. The existing hotel management company terminated their management activities with 14 days’ notice. Upon departure, the existing management company removed the senior executive staff from the Hotel. The Receiver immediately began the RFP process for a third party manager and hotel management company and quickly engaged the General Manager to supervise the remaining hotel employees during the transitional period. After several interviews, Hostmark Hospitality was selected and commenced operations within 18 days of the termination of the former management company. The Receiver successfully maintained the operations of the hotel during the management transition. The franchise agreement between the Inn of Chicago and Choice Hotels was terminated by Choice Hotels for failure to achieve satisfactory customer satisfaction scores as required by the franchise agreement. The Hotel was last renovated in 2009 and has been poorly maintained. The Receiver and hotel management company acted quickly to establish a temporary 60-day agreement, then continued to structure conditions which Choice would extend the franchise agreement for the term of the Receivership, preventing the loss of the Choice reservation system which provides substantial income. With the termination the former management company, there was no license, without which the Inn of Chicago could not provide liquor for meeting room events or service at the lobby bar. The Receiver immediately applied for temporary liquor licenses with the City of Chicago and the State of Illinois. Temporary licenses were obtained in time to satisfy prior commitments for catered events at the Hotel. The Receiver applied for permanent liquor licenses and completed BASSET training as required by the State of Illinois Liquor Commission. Upon the appointment of the Receiver, the existing housekeeper’s and engineer’s union contracts were expired for over one year. Upon further inquiry, the Receiver uncovered a significant pension withdrawal liability with the housekeepers’ pension fund. The Receiver was authorized to negotiate new collective bargaining agreements and engaged counsel to assist with negotiations and further investigate the pension fund liabilities. A lobby-level retail space was occupied by an independent coffee shop operator. The Receiver extended the lease on a month-to-month basis to retain limited food service for the hotel guests. The City of Chicago issued citations on the masonry façade that required a new façade inspection or completion of specific masonry repairs, to be completed every two years, by November 1, 2016. To minimize current cash outlay, the Receiver engaged the engineer who conducted the prior inspection to conduct a new inspection with hopes of deferring the cost of repairs to a later date.